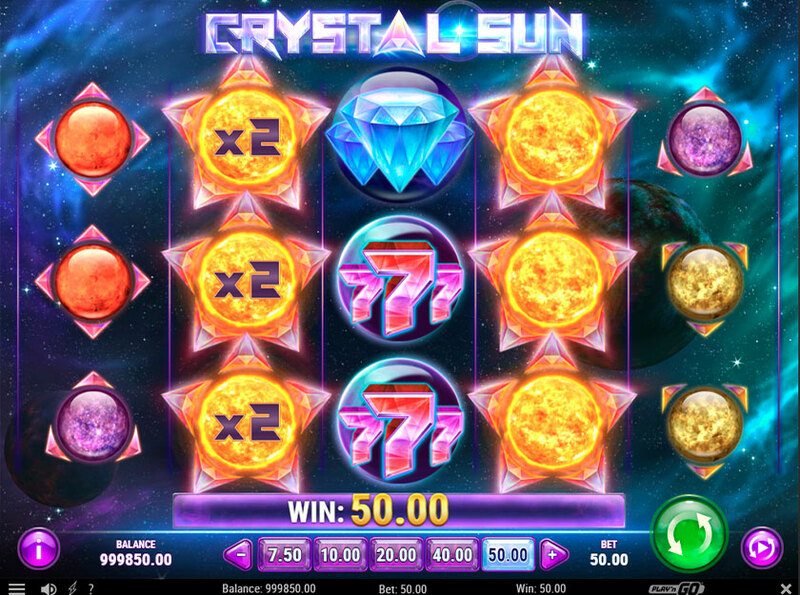 Crystal sun is a brand new slot by Play’n GO. You will be able to play it for free as soon as it is available. Right now you can read all the information we know about Crystal Sun. Crystal Sun is a classic 5 reels and 3 rows slot with 10 paylines. Top symbol is a diamond, and it pays 16x for five of a kind. Overall it has a simple cosmic graphics, which might attract some sci-fi fans. We have already played these slots, and it seems like a good alternative to popular slots without free spins, Ark of Mystery for example, as the maximum win on Crystal sun is much bigger. It’s a good idea to try Crystal for free first, before you spend your own money, as this slot looks different and might disappoint some of the players. Sadly, there are no free spins on this slot. However, this slot is packed with wild reel respins. When you land an expanding wild on 2, 3 or 4, it will expand and earn you a respin, where you can get another expanding wild and another respin, up to 3 respins. The twist is that you can actually get a multiplier on those expanding wild symbols, which can boost your wins dramatically because you can get up to x9 multiplier. Maximum win on Crystal Sun is 4000x, which make this, slot a high volatile one. Expect a lot of empty spins and small wins. If you like slots like Sizzling Hot or Ark of Mystery, then we suggest you try this slot as well, as it looks like a perfect slot for people who hate to wait for three scatters and just want straightforward action.